After a four year transformation, the Hyatt Regency Amsterdam recently opened its doors. Hakwood supplied the luxury five-star hotel with flooring in four different finishes, that are laid in chevron herringbone, plank as well as stair treads. 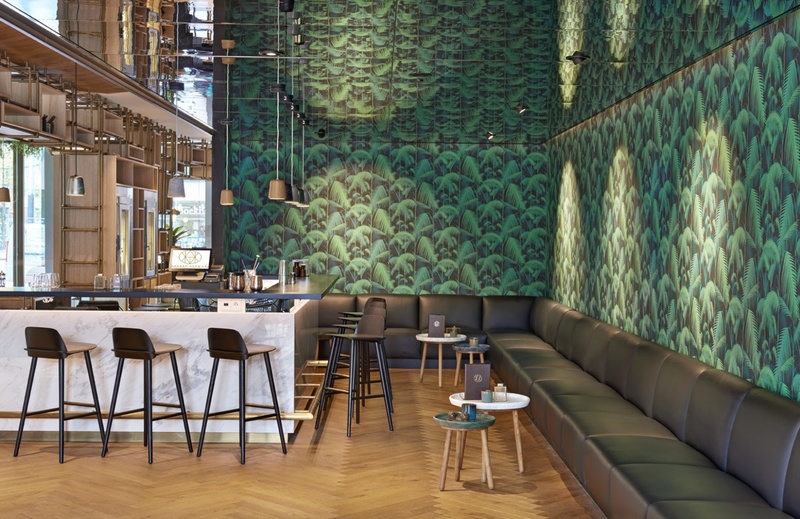 The wood flooring is a well suited addition to the design of the hotel that connects city and nature, and is inspired by the hotel’s location in a green neighbourhood rich with trees. You can find our flooring in multiple spaces, including the Mama Makan restaurant. The restaurant’s design was realized by Dutch studio Concrete. The studio is responsible for the concept, name, interior and total graphic identity of the restaurant. Mama Makan is a contemporary Dutch-Indonesian grand café. The theme connects the traveller with the local history of the Plantage (Plantation) District and involves envisioning the journeys of the ancient trading routes. With its 191 m2 of space the ballroom is the most important event location in the hotel. It has a striking herringbone wood floor and large windows that look out on a canal. The modern and open design offers endless possibilities for adjustable lay-outs. We enjoy being part of this project in the centre of our Dutch capital. For more photos have a look at the project page.